It's a Bank Holiday in the UK today – the perfect excuse for a cheeky day trip to get away from all the work stress and feel like I'm going on vacation. One of my absolute staple trips is Brighton, which is just an hour away from Central London by train, making it a quick and affordable getaway. 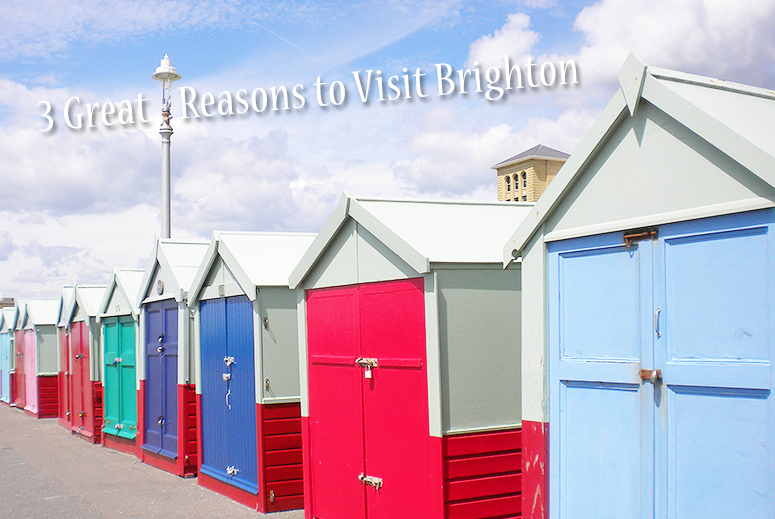 I find myself going back to Brighton time and time again, and in this post I'm highlighting three reasons why I love it so much. Brighton has a very laid-back and quirky atmosphere running through its heart. Think the most eclectic bits of places like Shoreditch and Hackney combined into one fun, family-friendly holiday destination. There are museums and even an Eastern inspired palace, aka the Royal Pavillion, to visit, in addition to plenty of shopping opportunities in the colourful Lanes which are filled to the brim with independent and unique stores. I especially love browsing all the gifty shops to pick up bits and pieces for friends & family, and I also always pop into Bert's Homestore for a colourful addition to my kitchen (they have some great pieces for blog posts and to brighten up any space in the home, really). Similarly to the quirky shops Brighton has in abundance, there are also plenty of places to sample some delicious snacks and meals. Whether you're in the mood for a cream tea, bistro lunch or 3-course dinner, there is a wide array of options for you to pick from. Personal favourites for a sweet snack are Choccywoccydoodah (here you can pick up some gorgeous chocolates for the road or sit down in the cafe) as well as any of the lunch rooms or bakeries in the Lanes. This time around, inspired by seeing them appear in vlogs on YouTube, I'm hoping to pop by 42 Juice (I've been addicted to freshly pressed juices the last few weeks, and a ginger shot will also help me keep going all day), Dum Dum Donutterie (to FINALLY try a cronut, which is a croissant/doughnut hybrid), and Red Roaster (this one solely because on its Instagrammable interior, not gonna lie). Which places outside of your hometown do you like to go to for a getaway and a refuel?